Edward Imeson (E.I.) Horsman opened a toy company in New York city in 1865 and became a leader in the toy industry. In the early years they produced a variety of composition dolls wearing wigs, molded or painted hair, sleep or painted eyes. About 1909 they used a new formula to make "Can't break Em" dolls like the Billiken. In 1986 the Horsman name was sold to an Asian company; Gata - Gatabox, LTD of Hong Kong, who produced dolls under the Horsman LTD. name. 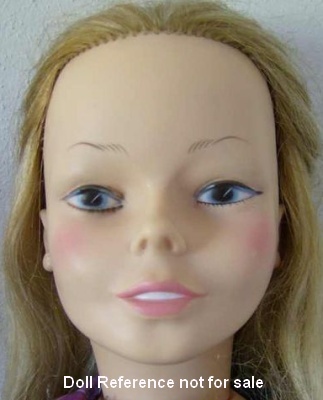 1960s Horsman Ruth's Sister doll, 26" tall, hard plastic body and legs, vinyl head and arms, rooted hair, sleep eyes with lashes, open mouth, marked Horsman T-27. 1960s Ruth Sister doll, 26"
1961 Horsman Jackie doll, 25" tall with rooted black hair and blue sleep eyes, marked: Horsman 19©61 JK 25 4, came in several different outfits. Clearly you can see the resemblance to Jacqueline "Jackie" Kennedy. 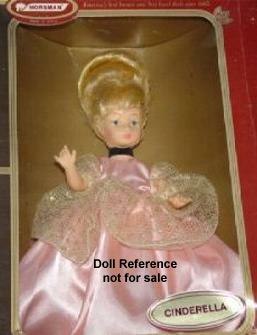 1963 Horsman Poor Pitiful Pearl doll, 11-12 or 17" tall, box front says; "Make her pretty make her wish come true!" Hard plastic jointed body, vinyl head with rooted hair, painted eyes, closed mouth, doll marked: ©1963 Wm Steig Horsman. 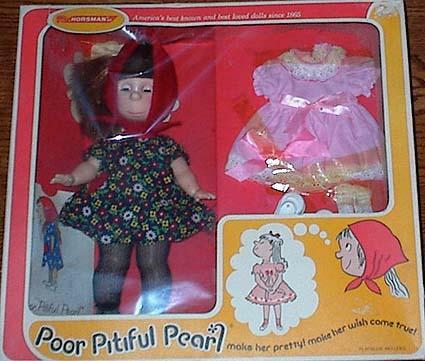 1958 Poor Pitiful Pearl doll version made by Brookglad Creations, a Glad Toy Company is shown on this page link. 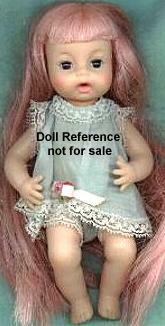 1976 Poor Pitiful Pearl doll version made by Tristar is shown on this page link. 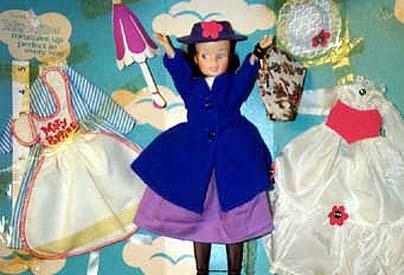 1964 Horsman Mary Poppins doll, 12" tall, see the Mary Poppins link for more details. There was also a set available of Mary Poppins which included both Jane Banks and Michael Banks too. 1964 Mary Poppins doll, 12"
1964 Horsman Thirstee Walker doll, 27" tall, soft vinyl skin with a wired bendable body, rooted hair, sleep eyes, marked Horsman TB-26. 1964 Thirstee Walker doll, 27"
1965 Horsman Cinderella doll, 11 1/2" tall, hard plastic, jointed body, rooted hair, marked: H 1965. 1965 Cinderella doll, 11 1/2"
1965 Horsman Flying Nun doll, 12" tall, celebrity doll, Sally Fields from the 1960s TV show, vinyl with rooted brunette hair wearing her white Nun's habit and white flying nun hat. 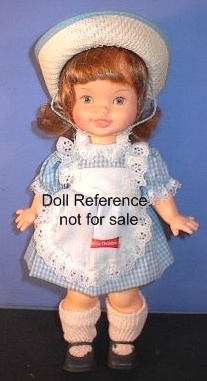 There is also a 15" Nun doll, not related to the Sally doll, has a typical Horsman doll face. See also the Dolly Darling pages, Flying Nun, for another smaller version by Hasbro. 1965 Flying Nun doll, 12"
1965 Horsman Patty Duke doll, 12" tall, celebrity doll, wears gray flannel pants and a red sweater red shoes, looks like a Tammy doll, marked: Horsman Doll 6211. 1965 Patty Duke doll, 12"
1965 Horsman Teensie Tot doll, 11" tall, black or white doll, hard plastic jointed body, soft vinyl head with short rooted hair, sleep eyes, real upper eyelashes, tiny painted lower lashes, closed smiling watermelon painted mouth, came various outfits, an Irene Szor designed doll. Marked: Horsman Dolls, Inc. T 11 or H.
1965 Teensie Tot doll, 11"
1966 Horsman Mary Poppins doll, 36" tall, Playpal sized doll, celebrity doll, similar to the smaller sized doll sold earlier, only a lot bigger, has a chubbier body more like a child than an adult. 1966 Mary Poppins doll, 36"
1968 Horsman Perfume Pixies doll, 3" tall, Liddle Kiddle Kologne doll competitor, three dolls in this series: Bluebell, Marigold & Rosebud, all vinyl with bendable limbs, long rooted hair, painted facial features a single upper lash extending from outer corner of eye, closed mouth, each with a permafragrance and packaged in a plastic dome bell. Each comes wearing a flocked sleeveless dress with a flower on front, in an appropriate color for the flower scent it is named after. ie. rose for Rosebud who is shown, blue for Bluebell and orange for Marigold. 1968 Perfume Pixies doll, 3"
1968 Horsman Tuffie doll, 17" tall, all vinyl, rooted blonde hair, closed mouth with tucked in lips - kind of pouty, and her hand index finger is pointing out. Marked: Horsman B-19. 1968 Horsman Zodiac Baby doll, 6" tall, all vinyl, jointed baby type, long pink rooted hair, black eyes, open mouth, came with a charm bracelet with the zodiac signs. 1968 Zodiac Baby doll, 6"
1970 Horsman Peggy Pen Pal doll, 18" tall, vinyl and hard plastic, rooted blonde hair, blue eyes, came wearing her red dress with writing desk and implements. 1970 Peggy Pen Pal doll, 18"
1971 Horsman Baby's 1st Sofskin doll, with the soft skin you love to touch, 16" tall, soft vinyl chubby baby body, sleep eyes, molded hair, open mouth, drink wet doll. Marked 3255 15 EYE 17 HORSMAN DOLLS INC. 19©71. Horsman made a lot of different Sofskin dolls over the years, they came in various sizes, some had rooted hair and the names varied, too. 1971 Baby's 1st Sofskin doll, 16"
1971 Horsman Super Flex Girl doll or Horsman Sofskin black Girl doll, 15" tall, one piece soft vinyl body with bendable limbs, jointed only at the neck, vinyl head with black rooted fair, brown sleep eyes, open mouth with hole, drink wet baby doll doll marked 3381 20 EYE HORSMAN DOLLS INC. 19©71. 1971 Super Flex doll or Sofskin Black Girl doll, 15"
1971-1974 Horsman Beauty Parlor Mannequin doll head and neck only; a vinyl head with long rooted hair no bangs, painted facial features with feathered brows, painted eyes with real upper eyelashes, painted lower lashes, open mouth with teeth. Note; mannequin head was not at this time sold with the Betsy McCall name. 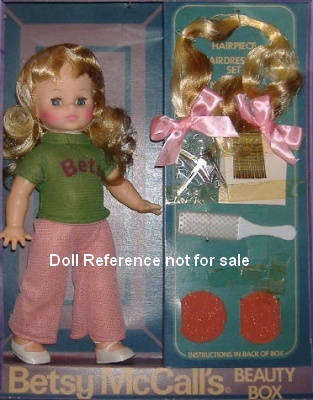 See also the 1975 Betsy McCall teenage doll below. 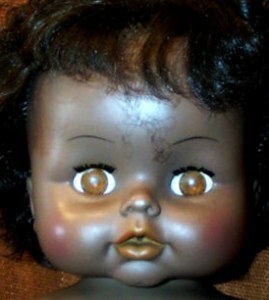 1972 Horsman Bye-Lo Baby doll, 14" tall, vinyl head and swivel limbs, cloth body, painted eyes, marked Horsman Doll 1972. 1972 Bye-Lo baby doll, 14"
1972 Horsman Little Debbie doll, 11" tall, advertising doll, vinyl head with rooted hair, painted upper eyelashes, open smiling mouth, jointed plastic body, dressed in a short sleeve blue & white check gingham dress, white apron pinafore with her name of front Little Debbie, matching straw hat with edges bound in gingham, white socks, black shoes. Made by Horsman for "Little Debbie Snack Cakes" company 25th anniversary. 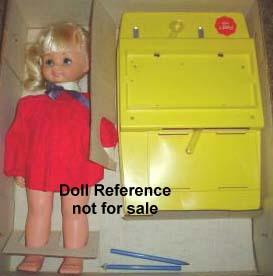 Marked on head: Horsman Dolls Inc. 19©72. This same face mold was also used on other Horsman dolls 1970s-1980s. 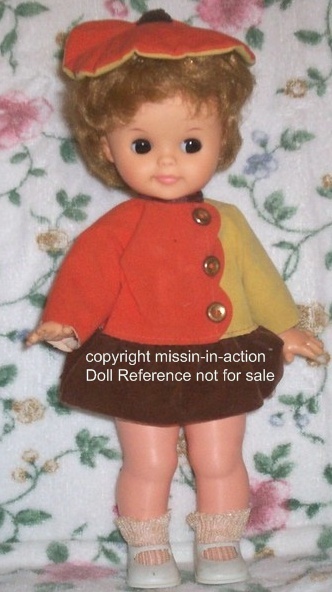 1972 Little Debbie doll, 11"
1972 Horsman Pippi Longstocking doll, 22" tall, cloth doll, red yarn braided hair, multi colored clothing, has her name on the outer smock or vest, doll marked 25-3 Horsman Dolls Inc. 1972. 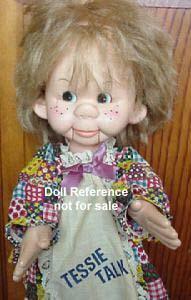 1972 Horsman Pippi doll, 18" tall, is all vinyl, with rooted hair and freckled face and is the doll shown in the photo. 1972 Pippi Longstocking doll, 18"
1974 Horsman Betsy McCall Beauty Box doll, 13" tall doll with extra hair pieces and non-toxic makeup. 1974 Betsy McCall Beauty Box doll, 13"
1974-1975 Horsman Happy Baby doll, 16-18" tall, vinyl head with rooted hair, soft stuffed cloth body, sleep eyes, open smiling mouth, made battery operated recorded sounds, she: laughs, gurgles and chuckles when you lift her, she wore (1974) a pink and white check two piece top and pants in (1975) she wore a pink and yellow two piece outfit. In 1975 she was 18" tall, 1976 she is 16" tall. 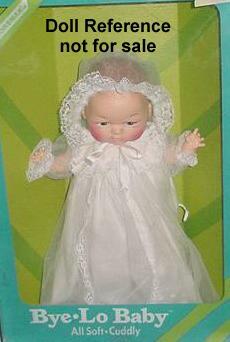 1980s Horsman Lil Happy Baby doll, 14" tall. 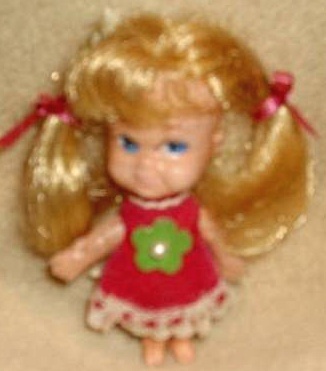 Sometime during the 1980s they dropped the "Lil" and and she was called just the Happy Baby doll, a larger size at 16" was called: Talking Happy Baby doll who spoke six phrases. 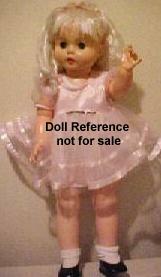 In 1985 a 16" tall doll was named Wake Up Happy Baby doll, who laughed, cooed and giggled when lifted. 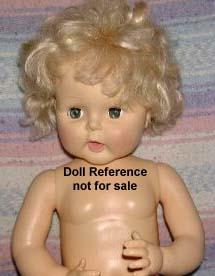 Horsman made Happy Baby named dolls into 2000. 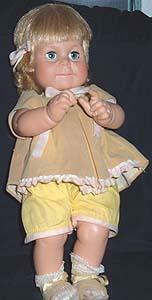 1974-1975 Happy Baby doll, 18"
1974 Horsman Tessie Talks doll, 18" tall, ventriloquist doll, or battery operated talker? I forget which, oops, has her name on her apron, rooted short hair, dark eyes, movable jaw. funny freckled face. 1974 Tessie Talks doll, 18"
1975 Horsman Betsy McCall doll, 29-30" tall, uses the head mold from the above 1971 Beauty Parlor mannequin, thus the same facial features; a vinyl head with long rooted hair no bangs, painted facial features with feathered brows, painted eyes with real upper eyelashes, painted lower lashes, open mouth with teeth, with a plastic jointed teenage body, came wearing a white ruffled eyelet blouse with black attached skirt, black and red beret hat, red open toe sandals. 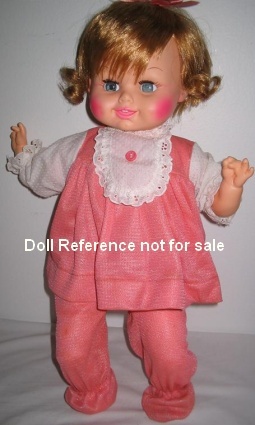 Marked on head either; B. M. C. Horsman 1971 or Horsman Dolls Inc. 19©74. 1976 Horsman Angie Dickinson, Police Woman doll, 9" tall, celebrity doll, all vinyl jointed doll with short blonde rooted hair, painted facial features, twist waist, flexible arms, jointed hips and knees that bend, wore a full red leotard, tan trench coat with belt and red boots. 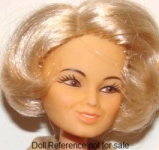 Celebrity doll character Sergeant Suzanne "Pepper" Anderson from the Police Woman TV series 1974-1978. Doll is marked Horsman Dolls Inc. 19©76. 1976 Horsman Elizabeth Taylor doll, 11 1/2" - Photo courtesy of Esther Ingelmo. 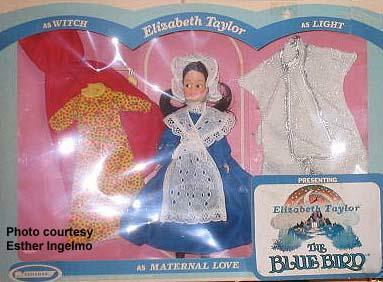 1976 Elizabeth Taylor doll, 11 1/2" tall, celebrity doll from The Blue Bird movie a George Cukor film. Other cast members were: Jane Fonda, Cicely Tyson, Will Geer, Todd Lookinland, Pavlova and Ava Gardner. Shown MIB, the outfits included are: Witch, Light and Maternal Love. 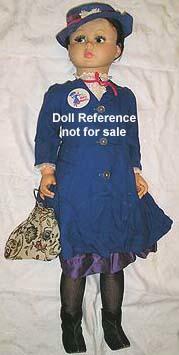 This doll is very similar to the 1964 Mary Poppins doll, 12" tall. 1964 Horsman Drinkee Baby doll, 12" tall, vinyl head with short rooted hair, sleep eyes with real eyelashes, open drinker mouth, jointed body at neck, shoulders and hips, doll marked B144. 1966 Horsman Answer doll, 11" tall, vinyl head with medium length rooted hair with bangs, sleep eyes, closed mouth, plastic body jointed at the neck, shoulders and hips, press the dolls back she nods her head Yes, press her tummy she shakes her head No, came dressed in an A-line sleeveless cotton dress, unknown how doll is marked. 1967 Horsman Yes & No doll, 11" tall, (above doll was renamed) vinyl head now with molded painted hair, blue sleep eyes, dressed in a flannel robe and matrching bonnet, the rest is about the same as prior doll, doll marked 66.
ca. 1967-1973+ Horsman Kewpie Kin dolls, 4 1/2" tall, all vinyl with lightly molded painted hair, left side glancing painted eyes and eyelashes, watermelon smiling mouth, starfish hands, wings on back, marked on front in red ink Kewpie on top of a red heart symbol, came undressed, additional outfits available separately, marked on back of head ©. Marked on back between wings © Cameo. 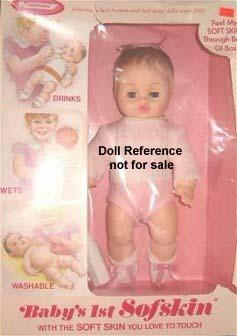 Originally designed by Rose O'Neill licensed by Cameo Doll Products Co, Inc. manufactured by Horsman Dolls in USA. Kewpie Kin was also sold as paper dolls. 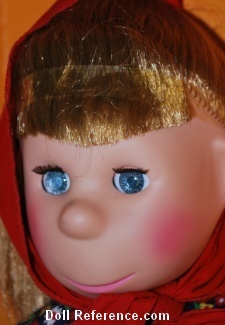 1970 Horsman Miss Sunbeam doll, 14" tall, advertising doll, hard plastic jointed body, vinyl head with blonde rooted hair in an up-do, blue sleep eyes, closed smiling mouth, wore a blue check short sleeve dress with a full skirt, white collar and cuffs, white apron with her name embroidered in red on waistband, white stockings and black shoes, doll marked Horsman Dolls Inc. 1970 on back of neck. Sunbeam bread advertising doll. Eegee also made a larger Miss Sunbeam doll in 1959.